Michael McFadyen's Scuba Diving - SS City of Sydney The SS City of Sydney was launched on Saturday 21 January 1854 at the Smith and Rodger shipyard in Glasgow, Scotland. 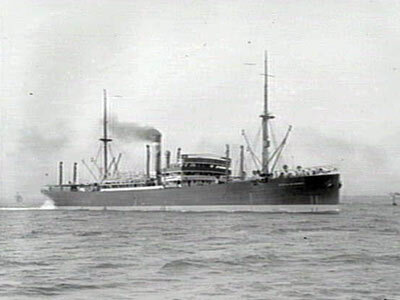 At 3 pm, the eldest daughter of James Paterson, Manager of the Australasian Steam Navigation Company Ltd, Miss Paterson (no mention in papers of her first name) named the ship. The new ship was a single screw steamship of 735 tons, almost 208 feet long and exactly 27 feet wide. She was built to very specific specifications of ASNC. The new vessel was also barque rigged, with three masts. The ship was a cargo/passenger liner and the first screw steamship built for the company. Power came from two boilers driving two engines, said to be four cylinders each (51 inch bore and 36 inch stroke). There were 50 berths in First Class, 60 in Second Class and 120 in Third Class. The new vessel sailed to Sydney, Australia on 22 January 1854 under the command of Captain Robert T. Moodie. The trip took 74 days. The ship was intended for use on the passenger/cargo service between Sydney, Melbourne, Brisbane and New Zealand. She arrived in Sydney on 15 April 1854. Seven firemen on the City of Sydney who had come out on the ship on its delivery voyage, refused to go to work on Tuesday 18 April 1854. They alleged that as they were in the colonies now, they did not need to abide by the contracts they had signed in Scotland. A warrant was issued and they were brought before the police magistrate, Mr Dowling, on Thursday 20 April 1854. Mr Johnson prosecuted the charge on behalf of ASNC and Mr Thurlow appeared for the defence. The agreements were proved to have been made in Scotland between Mr Paterson and the men. The contracts were witnessed by Captain Moodie. The firemen were to receive payment at the rate of £4 10s per month until the ship arrived in Sydney and from that date until the expiration of the contract, £10 per month (with the usual etceteras). If the current wages of the port exceeded £10, then they would receive that much per month. It seems that on the passage they had colluded together on the subject of the agreements and had come to the conclusion that on arriving in Sydneythey would be free to do as they pleased. When the evidence was concluded, Mr Dowling said he would not deliver judgment until the next day. He then suggested that a conviction would render the defendants liable to three months' imprisonment which would be a clear loss of at least £45 to each man and after that be liable to serve out the period for which they had agreed. He then suggested that perhaps they would avoid such a thing happening by returning to their duty. Mr Johnson said that the ASNC wished the men should be convinced of the validity of the contract into which they had entered and perform their part of it. He advised in the event of the men promising to return to their duty, he would withdraw the prosecutions. After a brief consultation with their attorney, three of the men expressed their willingness to perform their contracts and were discharged. The remaining four advised that they required time to consider what to do. They were looked overnight and on Friday 21 April 1854, they too advised that they would abide by the contract. They were then also discharged from custody. At 3 pm on Thursday 27 April 1854, the SS City of Sydney appears to have left Sydney for Melbourne on her maiden voyage. However, she returned to Sydney at 11 am on Saturday 29 April 1854 as her compasses were showing an "extraordinary variation". It seems that it was then decided to swing the ship and recheck the compasses as she did not depart again till Wednesday 3 May 1854. At 4.30 pm on Thursday 11 May 1854 she cleared Port Phillip Heads on the return voyage to Sydney. She arrived in Sydney 55 hours later on 5.30 pm on Saturday 13 May 1854. She probably did the voyage again soon after as on 23 May 1854 she again left Sydney for Melbourne. She appeared to settle into this route. On 4 July 1854 it was announced that the City of Sydney would be out of action for two weeks while some work was done on her. The main work was to remove the existing prop and put on a spare one brought out from Scotland. This prop had a finer pitch and should let the prop turn at higher revolutions giving an increased speed. The other work was to sheath her decks and sundry minor things. She appears to have returned to work about 22 July 1854 or so. On 6 December 1854 City of Sydney left Melbourne for Sydney with the mail from England. This had been delivered from London by the Argo and contained newspapers that reported on the fall of Sebastapol (Sebastopol) in Ukraine (now called Sevastopol). This was during the Crimean War (1853-56). However, Sebastapol had not really fallen. It was again reported that it had fallen to the Allies on 17 June 1855 (again the news came to Sydney via Captain Moodie) but this was not true. The city finally fell to the England/French/etc coalition on 9 September 1855. There were also Australians fighting in this war. On the evening of Sunday 18 November 1855, Captain Moodie got into trouble when he fired a gun while proceeding up Sydney Harbour. He was apparently announcing/celebrating the destruction of Sweaborg. This was also in the Crimean War and is now called Suomenlinna and is part of Helsinki, the Capital of Finland. On 30 November 1855 he appeared in court and pleaded guilty to firing a gun. He was fined the minimum fixed penalty of £5, although the judge remarked that if it was within his power, he would have only fined Moodie a farthing (0.25 of a cent). On the morning of Tuesday 11 December 1855 the City of Sydney came up Sydney Harbour and Captain Moodie again fired off his guns. This time he did not get into trouble as he really did have good news. Sebastapol had fallen and the Crimean War was over. Thursday 13 December 1855 was declared a public holiday to celebrate. It appears that the Sydney Morning Herald arranged for its readers to contribute money (in 6 pence lots) to a fund to pay Captain Moodie's fine. On 12 December 1855 Captain Moodie was presented with the fund. Captain Moodie wrote to the Herald the same day thanking them for the money. He also said "I know not how I have deserved this especial mark of their favour, but I assure you it is at all times a great satisfaction to me to announce good news, and if I do some times arouse the good citizens of Sydney from their slumbers, by the noise of my reports, I assure them, I will never do so unless I have something pleasing to communicate, and then they will pardon this trifling infraction of the law". For all this time the City of Sydney exclusively ran on the Sydney to Melbourne route. City of Sydney was once used to replace the mail ship SS European on the Sydney/Columbo (in Sri Lanka formerly Ceylon) trip when the European was being repaired in Sydney. The return journey from Colombo was a record, beating the normal mail ship by 10 days. On arrival in Sydney, the skipper was given a testimonial dinner. On Tuesday 10 April 1860 the City of Sydney left Sydney under charter to transport troops to Taranaki in New Zealand during the New Zealand Taranaki War (a Maori uprising). On this trip 120 troops from the 12th Regiment and 46 from the Royal Artillery were moved from Sydney to New Zealand. She left Taranaki on Tuesday 17 April 1860, arriving back in Sydney on 22 April 1860. In mid-1860 new boilers were constructed for the ship and in early August 1860 these were installed in the ship. It is also possible that new engines were installed at the same time and some other works also carried out. Other than the above, the ship appears to have had an uneventful life until the night of 5-6 November 1862 (not October as reported in Shipwrecks of Twofold Bay/Disaster Bay by Tim Smith, NSW Heritage Office and one other source). At 6 pm on 4 November 1862 the City of Sydney left Sandridge Pier Melbourne bound for Sydney. Included in the approximately 100 passengers were "the Sydney Volunteers" who I had originally thought were possibly coming home from the Taranaki War but I now know that they were a rifle club returning from Melbourne. In addition, on board was Private Joseph Dickson Junior. He was also returning from Melbourne and may have been one of the "Sydney Volunteers". Dickson had won a shooting competition at Randwick Racecourse with a top score of 35 points. The closest competitor scored 31 points. His prize was a "Whitworth Rifle in case with Ammunition", valued at thirty five pounds. He was then selected to represent NSW against Victoria in the "First Intercolonial Rifle Match", held 3 November 1862. NSW beat Victoria but his score of 125 points with his new rifle, was a tie for lowest score. The ship left Port Phillip Bay at about 10 pm. The weather was fine, the wind light but there was a heavy southerly swell. The ship rounded Wilsons Promontory at 8am on 5 November 1862 and she passed Gabo Island at about 12 midnight on the night of 5-6 November 1862. The seas were calm and there was a light wind. Captain Moodie left the bridge at 12.15 am after telling the First Officer the new course to steer. Just before 2 am, the First Officer called Captain Moodie to the Bridge as there was now a great deal of fog around. Arriving on the deck, the skipper was told that the ship was three miles off Green Cape. 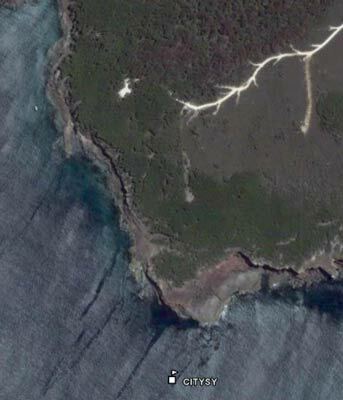 Green Cape is about 26 kilometres to the south of Eden and just north of the New South Wales/Victoria border. Later on in 1883, a 29 metre high lighthouse was to be constructed there (it is still there but no longer in use). The Captain was obviously worried as he ordered the ship's course to be altered one point (11.25°) to the east to take the ship further clear of Green Cape. By this time the fog was even denser. Apparently he went back to his cabin to get his watch when the call of "breakers ahead" was given. Captain Moodie ordered the engine to be put in reverse but before this occurred, the City of Sydney went aground. The engine was reversed but to no effect. The impact had thrown many passengers out of their bunks and smashed many of the lamps in the saloon. The passengers and crew were ordered to the rear of the ship in an attempt to loosen the bow. The ship was now taking water at a considerable rate and the heavy southerly swell was rocking the ship severely. The sea looked like swinging the ship around so that she was parallel to the shore. For this reason the port boat was lowered and the starboard anchor put into the boat. The boat took the anchor out to the south-east and dropped it in deeper water. An attempt was made to pull the bow off the rocks by winching in the anchor. Unfortunately, the anchor came in towards the ship and nothing was achieved. The passengers were perfectly at ease during this work. All the remaining boats were now lowered and the women and children put in one of them. Joseph Dickson and Private Lynch went below decks to their partly water filled cabin to save their rifles, leaving in one of the last life boats shortly before the ship sank. The NSW government later compensated team members for their losses. Captain Garrard was put in charge of this boat and took them a short distance away from the sinking ship and landed them in a protected cove. The last to leave the ship were the Captain, engineer, carpenter, steward and two quartermasters. Apparently Captain Moodie had to be dragged off the ship and as they were getting into the smaller vessel, the City of Sydney suddenly tipped over on her starboard side and sank. So quick was this that the two quartermasters were thrown into the water and swam to the boat. As the ship rolled over, the mizzen topmast hit the ship's boat but luckily they got clear with little damage. The ship was now almost totally underwater, with only a small section of the bow and topmast showing. The other boats also went to the same small cove where the first boat landed and the Captain was cheered ashore by the passengers, obviously delighted that everyone had survived. During the night fires were lit to keep warm. 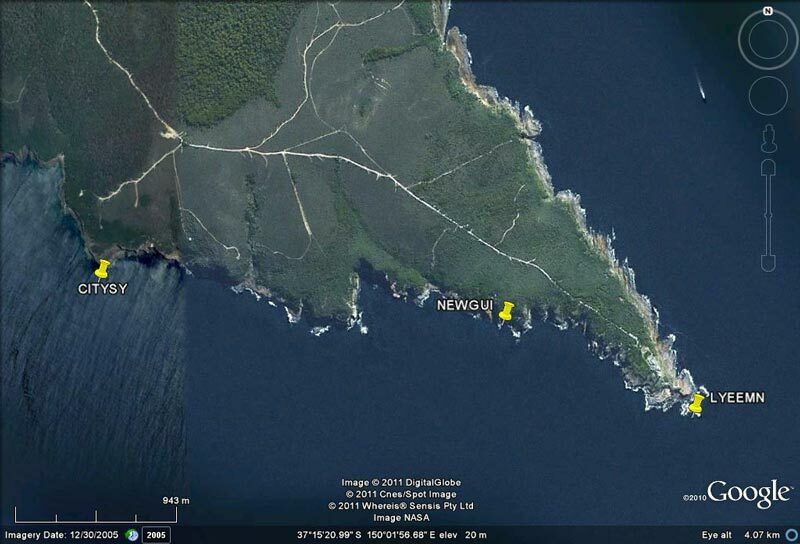 At dawn, they could see they were about three kilometres from Green Cape (in fact exactly 3.56 km). All the boats then set out to row the almost 30 kilometres to Eden. The first one arrived after six or seven hours and the SS Hunter was dispatched from Merimbula (a short distance north of Eden) to help. She met the remaining three boats and towed them the remaining distance to Eden. The survivors were received at the Crown and Anchor Hotel in Eden by the owner Mr T. Matthews. In any case, when the first boat arrived, the Water Police, two whaleboats and the Customs launch were sent to see if they could salvage anything from the wreck. The ship was a total loss, with the estimate given of £25,000 for the ship and cargo. The cargo was said to include machinery, axes, ale, brandy, opium rope hats and boots, quite a mixture. A Mr and Mrs Shannon, recently married, were said to have lost all their wedding presents. Today the wreck lies in 15 to 21 metres of water. As the City of Sydney is quite close to the shore, it can only be dived in calm seas. Luckily, the wreck site is protected from some winds, especially north-easterly and easterly winds. However, due to the distance from Eden (about 30 kilometres to the wreck), the local charter operators do not generally dive this and the nearby wrecks and it is a long way to run down in anything but very calm seas. Therefore it is likely that you will need to use a private boat. If you have a smallish boat (say 5 metres), the best bet is to run out of the small coastal village of Womboyn. This requires a lot of planning as the lake, river and bar are very shallow and you can only travel to the sea from the boat ramp in the period about two hours either side of high tide. Therefore you need a high tide of about 1.8 metres, occurring about 9 am to 12 am enabling you to exit the bar at 7 am to 10 am. Also, you need calm seas, no swell at all from the south but even very strong north-easterly winds and seas should be okay. The actual wreck site is quite easy to find. The GPS Reading for the site is approximately 37° 15' 28"S 150° 00' 40"E (note that all my GPS Readings are using AUS66 - if you use any other datum, you will need to convert the reading - see my GPS Page for more details). This will put you off "City Rock", named after the shipwreck. It is a very large rock that slopes down to the east. Line up off the corner as shown in the plan at left, about 50 metres out. The mark looking towards Green Cape should look like the other diagram. Drop anchor here. This should put you very close, if not in the middle of, the main part of the wreck. The seabed here is a rocky reef, with some kelp and sponges. The City of Sydney is a very broken up ship, with the main features being the large engine, the prop shaft and the remains of the stern section. This piece has the propeller, rudder and a bit of the hull in one piece, still lying on its starboard side as it was over 135 years ago when it sank. In addition, the blades of the prop (four I think), are nearly all broken off, making it certain that then engine was still running when the ship turned over and the prop hit the rocky bottom, breaking the blades before the steam ran out. There are other things to see, including largish pieces of keel and hull as well as the occasional bollard and winch. To the south east are the two anchors, both lying out from the remains of the ship. The port anchor lies where it fell when the ship sank and the starboard one is on the sand where the lifeboat carried it. Once again, this is a very attractive shipwreck, although people not interested in shipwrecks may find it a bit boring. In my view, well worth the effort involved in the long trek to dive her.